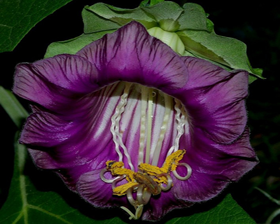 Cobaea or Cathedral Bells Vine is one of the fastest-growing and most trouble-free vines you will ever grow, capable of growing 400 cm in a single season. Grown as an annual Cobaea grows rapidly and blooms like crazy from July until frost. Garden pests do not disturb this amazing vine as it grows effortlessly by twining its way over a fence, trellis or any support provided. Its spectacular 7 cm blooms also fill the air with a very pleasing honey scent throughout the growing season. Alternatively it may be grown inside or in a heated greenhouse, where it will continue to bloom for many years. Height: 300 to 400 cm. Flowers: July till first frost. Sow Outside: May. Cover seed. Sow Inside: March - April. Germination time: 1 to 7 weeks. Temperature 21°C. Requirements: Full sunlight or partial shade. Average soil. Trellis. Regular watering. If growing perennial cut back/prune in spring.